Our 365-mile gasoline free Road trip from Silicon Valley is about to begin. 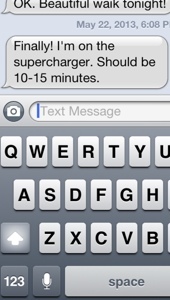 The plan was for my husband to top off the Nissan Leaf with a supercharger a couple miles from our starting point. And, as you can see he has been delayed a bit. Still, now the charger is open and we expect to be on the road. At 7 p.m., one hour later than planned. Let the fun begin!